UConn Effectively Ends Marquette's Season ~ The Bucky Channel - The World of Sports from Wisconsin's Perspective. How come whenever one of our teams lose one of their big stars to injury, we always end up losing the game as well? 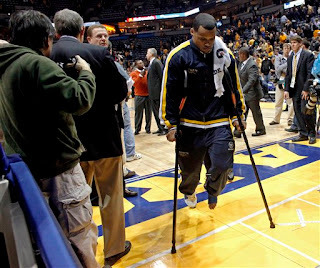 Which forces me to write titles like "Marquette Loses More Than Just The Game." Either way, that's exactly what happened on Wednesday night as Connecticut came into the Bradley Center, got Jim Calhoun his 800th win, and left Marquette forced to play through the rest of the year without Dominic James. A broken bone in his left foot will end the James' career at Marquette, an injury which occurred just four minutes to play in their 93-82 loss to UConn. It's obviously a worst-case scenario situation for the Geagles, who have depended heavily on their three senior guards to get where they are at this point in the season. I still think Marquette can win the Big East regular season with some help, and still expect them to make a run in the Big East Tournament. But as far as national title hopes? Gone. Best case scenario for Marquette without James is a trip to the Elite Eight, but even that seems unlikely now. Unless Maurice Acker pulls a miracle and picks up James' slack and then more, Marquette's season isn't looking as hopeful as it was a few days ago. The injury to Dominic forced Wesley Matthews and Jerel McNeal to play a full 40 minutes, a trend that probably shouldn't continue. Again, I still think this team is capable of making a run, but you can't take the injury to James lightly. In the end, it was a tough loss to take, injury notwithstanding. The Daily Drink credits UConn for their second chance points in the second half, and the play of A.J. Price. The Brew Town Beat has 25 random facts about the game, written in list form. As for me, I would have had this recap up a lot sooner, but Thursdays are usually busy for me. And by that I mean there are like five different Lost recaps I have to read during the day before I can even think about The Bucky Channel. Thanks though, for your patience! Next up for MU is a contest at #6 Louisville on Sunday morning, followed by a matchup against (soon no longer to be) #1 Pittsburgh.